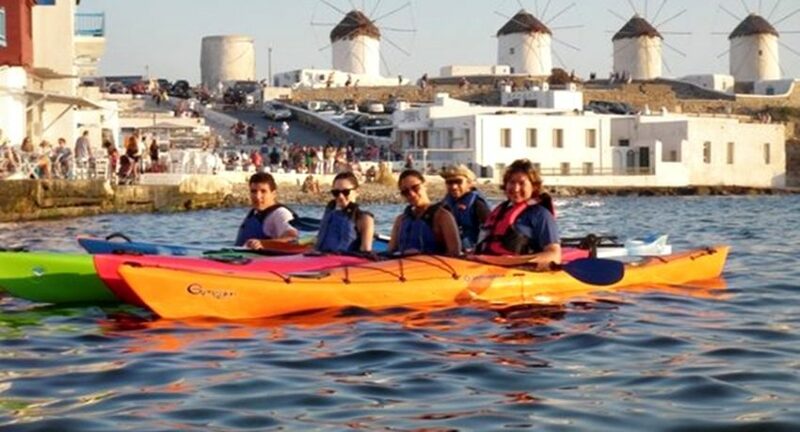 If you like exploring nature or sports activities, Mykonos Kayak is the ideal activity for you. There is no need to have any special knowledge, the friendly and experienced staff of Mykonos Kayak will prepare you and will be there for you so as to experience an unforgettable adventure and discover places of Mykonos that you couldn’t see them otherwise. Each team has a skilled leader, because your safety is their first priority. They will transfer you free from the hotel you stay up to the meeting point and in the way back they will take you back to the point they picked you up, they will make you a complete introductory course and will prepare you with the proper equipment in order to start your adventure. You will explore the coasts of Mykonos, go trekking, swim, sunbathing, you will relax and play several entertaining games. The staff of Mykonos Kayak will also supply you with healthy snacks and picnic. Useful tips: Bring your swimwear, shorts and T-shirt, towel, old sneakers or sandals that tie up so as not to matter if they get wet and sunscreen with a high protection factor. You will find Mykonos Kayak at the beach of Agios Sostis. The excursions are daily from 9:30 to 15:00 and modulated according to the weather. The groups are composed of 20 persons maximum and the ages that can participate is 14 years old and up. If you have family with younger children, they will integrate you in a group with fewer people for your safety. You can also arrange private excursion upon request. A few days after your trip, Mykonos Kayak will arrange to send you free multiple photos at your mail in order to always remember the beautiful moments you spent and the landscapes you saw.